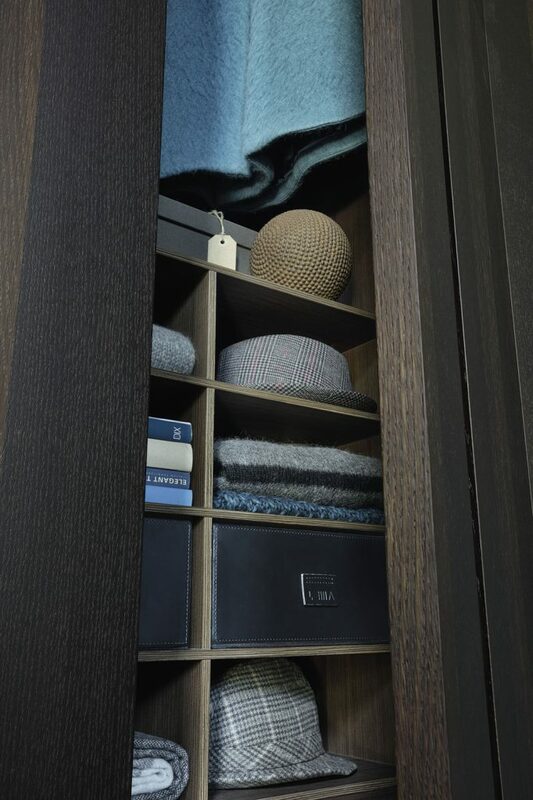 Creating a Wardrobe that suits your style and focuses on your storage needs, is what we do best! Choosing the right finishes, the right mechanisms and interiors can be a difficult task if you’re not too familiar with storage furniture. That’ why we’ve put together a simple guide to get you started on the way to realising your ideal wardrobe. Take note of what to consider, what to expect and some of the latest trends to make sure you have a contemporary product to test the ages. The first step when choosing a wardrobe is deciding on what type of doors you want. Whilst many of our doors come in different styles and finishes, the basics are all the same. We’ve put our thoughts forward on the benefits and disadvantages of the different door types you could have. Hinged Door Wardrobes – Hinged doors are a classic, reliable and sturdy. They are ideal for most environments and can be realised in a wide selection of finishes and be made to suit almost any floor to ceiling height. The main obstacle of hinged doors is the space required to open them fully, we recommend that there is a minimum of 70cm between the closed door and any other objects; such as a bed or night stand, to allow enough room for the door to open fully. 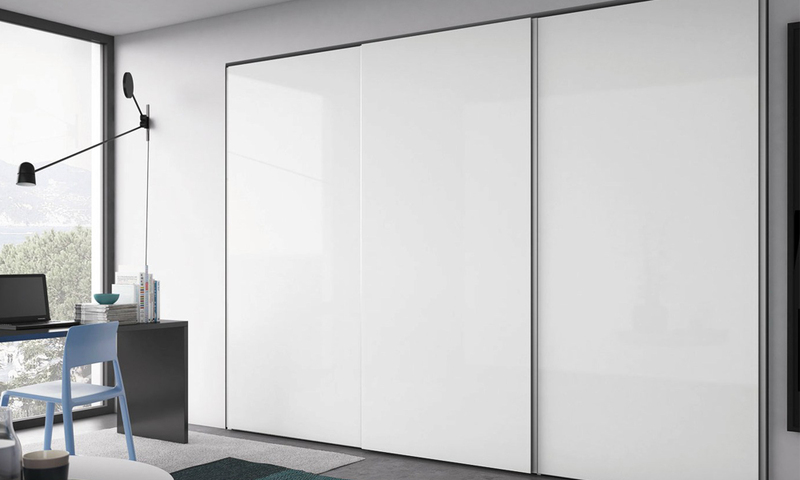 Sliding Door Wardrobes – The mechanism of sliding doors makes for a contemporary style and adds seamless movements to any wardrobe. Sliding doors can be a great solution for fitted spaces or where there is not enough space to allow for a hinged door. 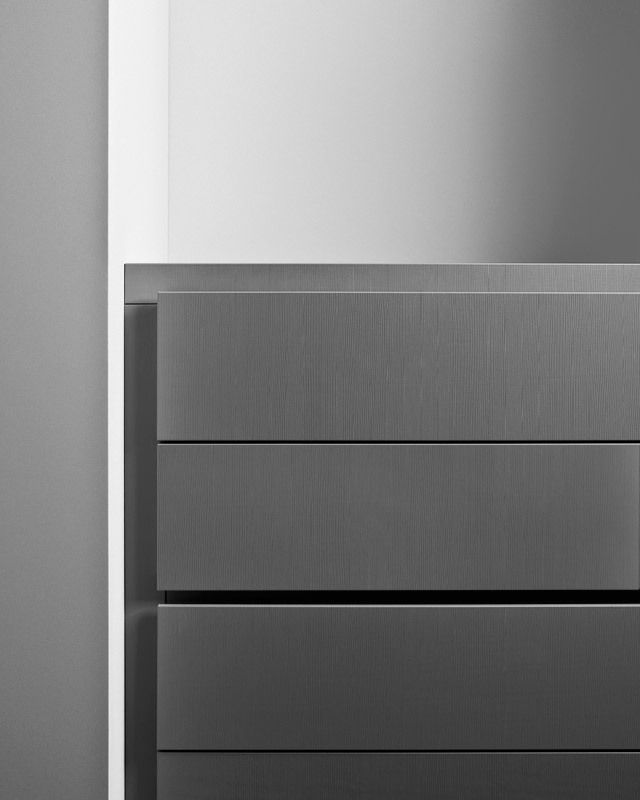 Our products use a track fitted to the top of the wardrobe, which allows the doors to freely move. Consider that because of this, custom sizes may not always be possible, always inquire and we can advise you on the possibilities available. Flush Sliding Door Wardrobes – Some of our brands also offer flush sliding solutions, which we are happy to discuss with you. The mechanism of flush sliding doors allows the front of the wardrobe to be completely linear (like that of a hinged door solution), one door is then pulled forward and slides across the other, meaning you get a flat-line look with the seamless movement of sliding doors.The restrictions of flush doors can be the possibility of customization, because the mechanism is so specific, they may not be plausible for every size & space and like sliding doors it may not be possible to fit in to a specific height. The fundamentals for figuring out any wardrobe configuration is knowing the space! If you’re looking to add a freestanding wardrobe to your bedroom or have a designated area that you would like fitted wardrobes placed, always measure up. Specify the widths, depths and floor to ceiling heights, so that we know what to work with. Consider any obstructions that are around, radiators, windows, sockets? If there are any non standard features such as pillars or sloped ceilings, these need to be recognized so that we can assess what the best solution will be for you. The basics of any wardrobe are how they are configured, how it will fit in to the space and where it is going to be. We will always offer advise and technical details when making a choice, we will say what will work and wont work, offering solutions and alternatives, to make sure you have a suited wardrobe to your space. We have a range of different finishes available across our brands, meaning that there is something out there to match your style needs. There are a few things to consider when picking finishes. Firstly, consider what door you have and always ask what finishes are available. Do you want something basic that will work with many colour schemes? Or do you want something bold or more specific that will make it more unique? Remember this is an investment that will last for a long time, so choose wisely. Lacquers are great for lots of wardrobes, they offer a wide choice of colours and offer a simple yet effective solutions for matching colour schemes and existing decor in the home. Think about if you are likely to drastically change the colour scheme of the room, do you need neutral tones that can easily be matched if you do? Wooden finishes provide a timeless and elegant look whilst adding a richness to the style. However, be wary when choosing darker wood tones, although these are a proven popular finish, if the space is small or there is restricted natural light, it could make your room feel smaller and darker. Glass and Mirror finishes offer the ultimate luxury exterior, with mirror in particular adding an extra functionality to the product. However, be realistic, these materials are not as flexible as other finishes when customization is involved, whilst they add a truly wonderful style to any space also take in to account the cost. A solution may be to mix finishes together to get a different result. We know the importance of maximizing your storage space to its fullest potential. There are a range of different accessories to choose from for all your storage needs, from shoe racks to internal drawers. It’s always best to think about three things: what you have, what you want and what you need. If you have a lot of hanging items such as tops, jackets, cardigans, consider double hanging spaces, try and maximize the hanging potential to make sure you have enough. If you’re looking to buy more of something like bags or shoes, think about shelving solutions, make sure you are covered for items you already have and that you have space for anything you are going to buy if you’re not willing to move anything or demote some items. Don’t go overboard! Adding more and more is not only going to increase the cost, adding too much inside can really overwork your wardrobe. It may look too cluttered and chaotic and not actually provide you with as much storage flexibility as you would have liked. We’ve taken the liberty of highlighting some of the most popular accessories below, along with the benefits of having them. Remember, our brands offer similar solutions across the board but not everything is always available for every wardrobe. A great way to hang trousers, offering a neat and convenient solution in any wardrobe. Perfect for any trouser type these can save space vertically inside the wardrobe allowing them to be placed lower or to have a shelf underneath. However, if you have a lot of trousers it may be more beneficial to use a traditional hanging rod with your trousers on clothes hangars as you can get more in the space than you would in a designated trouser rack. Cubbies offer a fantastic solution for storing folded items like scarves and gloves, or for housing hats and other smaller accessories. They offer a nice aesthetic for inside the wardrobe, however make an informed choice as to how many items you have that you want displayed rather than hidden away. 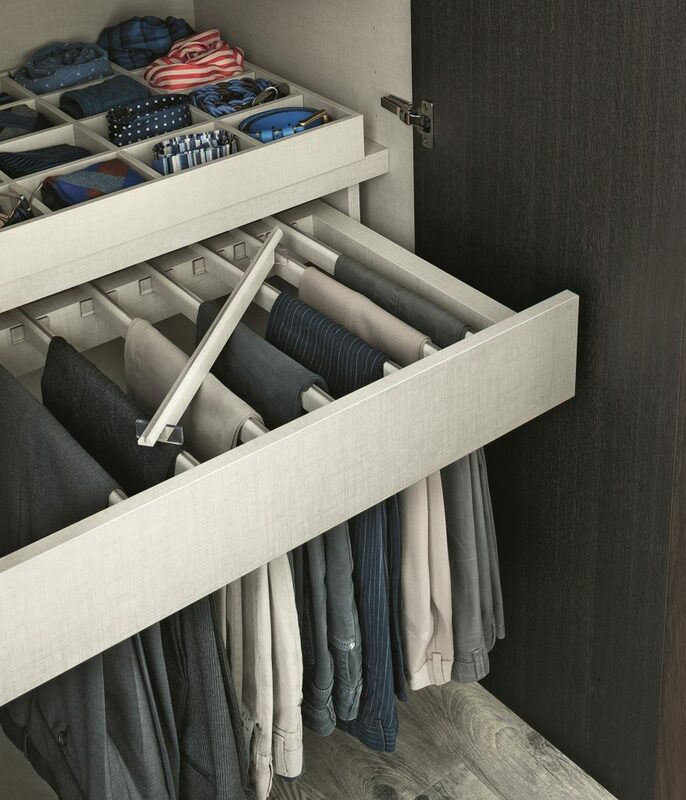 Drawers are a staple choice for any wardrobe. They provide much needed fold away storage for undergarments, scarfs, blankets, socks and much more. If you are short on space elsewhere in the bedroom, placing drawers inside your wardrobe is a great storage solution. Drawers can also be used to house other trinket accessories like divided trays and jewelry holders. Your shoes deserve a designated place to live. Shoe racks are a great way to provide order to your footwear and to display them in pristine fashion. If you’re look for a convenient and straightforward way to showcase you shoes, then inclined shoe shelves are ideal. In addition, if you prefer to house your footwear away then pull out shoe racks provide a marvelous solution for keeping your shoes neat and tidy and providing a practical way of getting them out when needed. After visiting the Milan fair this year, we got to see some great innovations from our brands and some interesting designs. What’s apparent is the development of integrated lighting, it seems now more than ever that people are looking to add that extra something to make their wardrobe more special and ultimately unique. Vertical lights have been introduced in many of our brands’ products and offer an alternative solutions to shelf lighting, allowing the entire interior module to be illuminated! Another trend we have seen develop is the use of inclined shoe shelves opposed to pull out solutions. With the desire for people to want to showcase their clothes and footwear, shoe shelves have become a great way of displaying your finest collections. 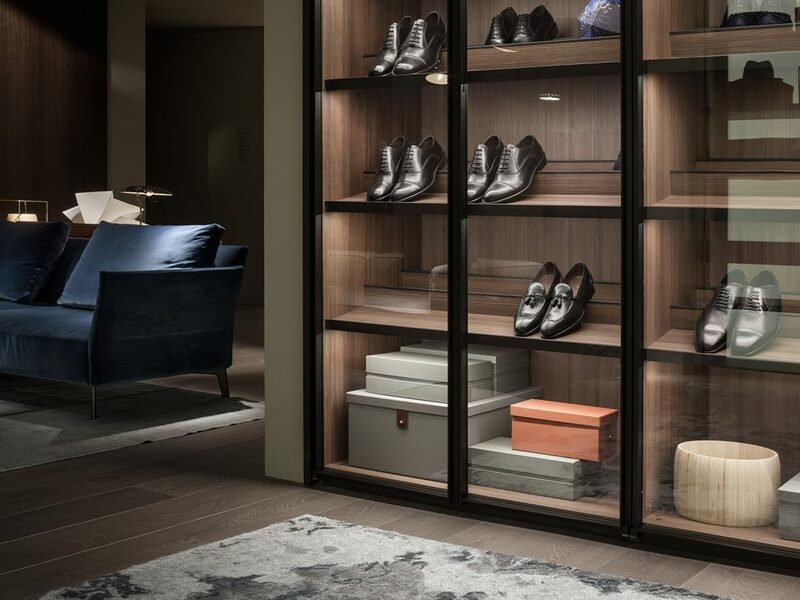 Using a glass door module with vertical lights and shoe shelves, has become a way for people to display their shoes in the most tremendous fashion.